Most beach-goers expect a couple of things to wash up on the beach. Seaweed, shells, maybe some fish. But sometimes a lovely stroll on the beach gets interrupted by–perhaps, a giant metal die? How did that get there? From animals to Legos to mystery items, the weirdest things wash ashore and interrupt your tropical vacation.They are certainly not what any swimmer or authority was expecting. See if you can predict what odd things have washed up on the beach in the past thirty years. You won’t believe which large land mammal showed up on the beach! 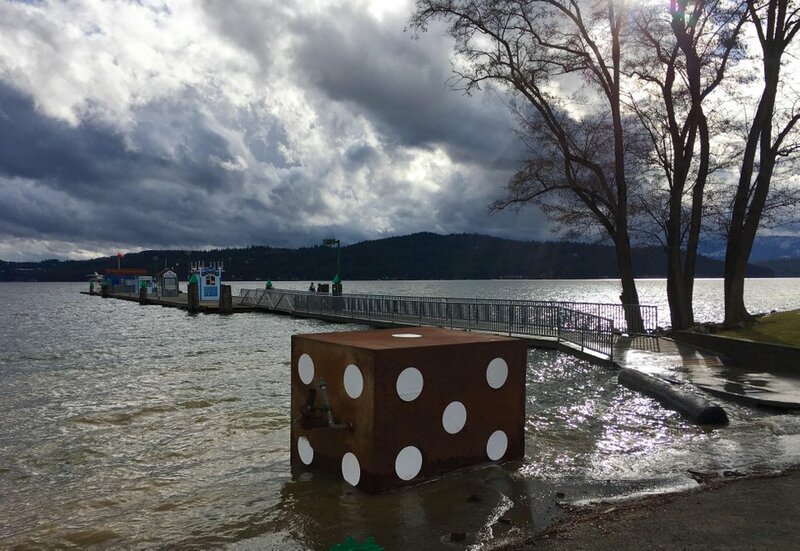 This giant die washed up on the shore of Coeur d’Alene, Idaho in 2017. Reddit user rickrage snapped a picture and posted it to r/mildlyinteresting to show the world. Except users found it more than just mildly interesting. The “die” was actually a plain box that washed up on Driftwood Point in 2008. The Gridley family painted big circles on the tank to make it look like die. It remained near the Gridley’s seaside shop until it drifted 36 miles away to Driftwood. In this unfortunate case, a giraffe washed up on the beach in 1981. According to the New York Times, the giraffe fell into the harbor at Brooklyn Dock. Later, the giraffe was discovered by The Army Corps of Engineers off the coast of New York City. Not much is known about this strange story, but we do know that the poor giraffe sadly didn’t make it. 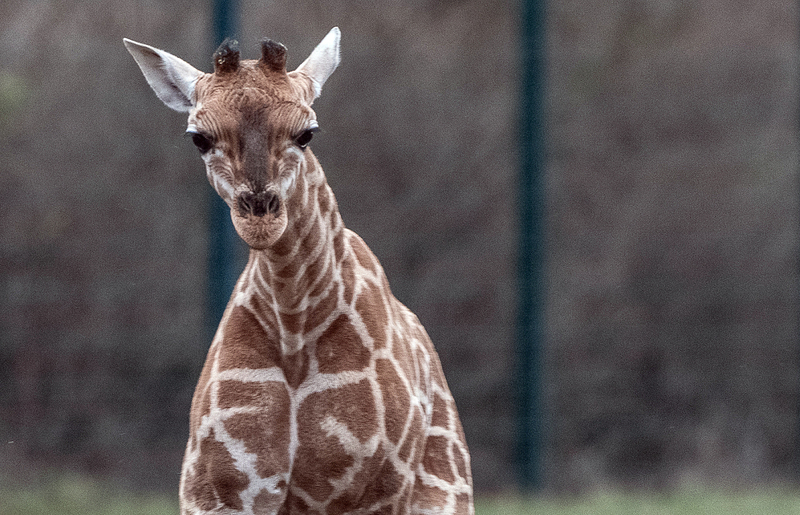 New York magazine claimed that the giraffe escaped from a circus ship, though this has never been confirmed. Coming up, an 80 million year old animal making its appearance along the shoreline. 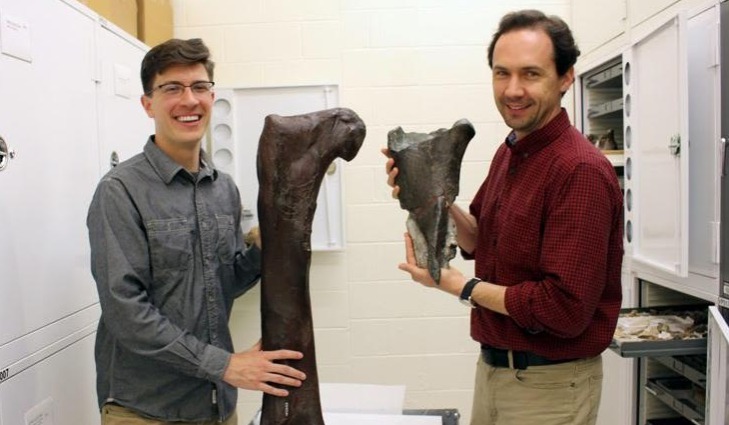 These 80 million year old bones were found on the beach among sea creature fossils. In 2012, Burke Museum research associates spotted the bones while exploring Sucia Island State Park. The fossil belongs to the same dinosaur family as the velociraptor and tyrannosaurus rex, although the actual species has not been identified. Because the bones were so well preserved, scientists believe that the dinosaur lived in shallow water. The giant bones washed up on Sucia Island beach and lay buried under sand and rocks. At 17 in long and 9 in wide, it’s a big find! The Aplin brothers were scouring the coast of Wellington, New Zealand for a diving location when they ran into a 14 ft long giant squid. The brothers then contacted the National Institute of Water and Atmospheric Research, who later removed the squid. The largest giant squid recorded was 40 feet long, so this was small in comparison. 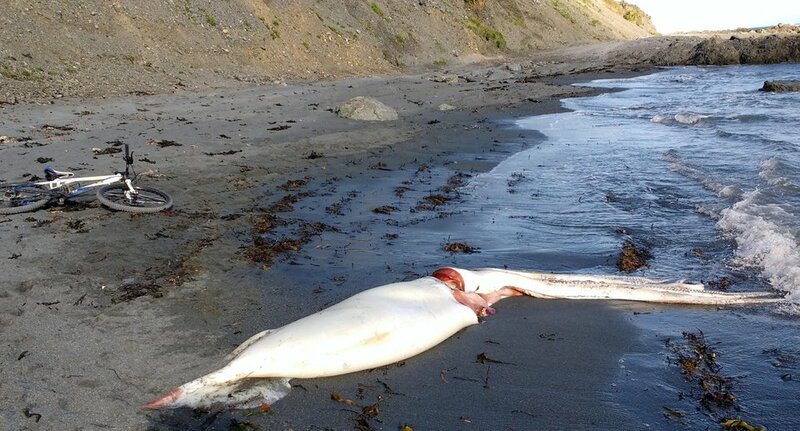 Because giant squids are deep sea creatures, no one is sure how one washed up on the beach. It sure beats any marine animal the Aplin brothers were diving to see, though. Back in 1997, a container of Lego pieces fell into the sea, and are still being spotted on beaches today. 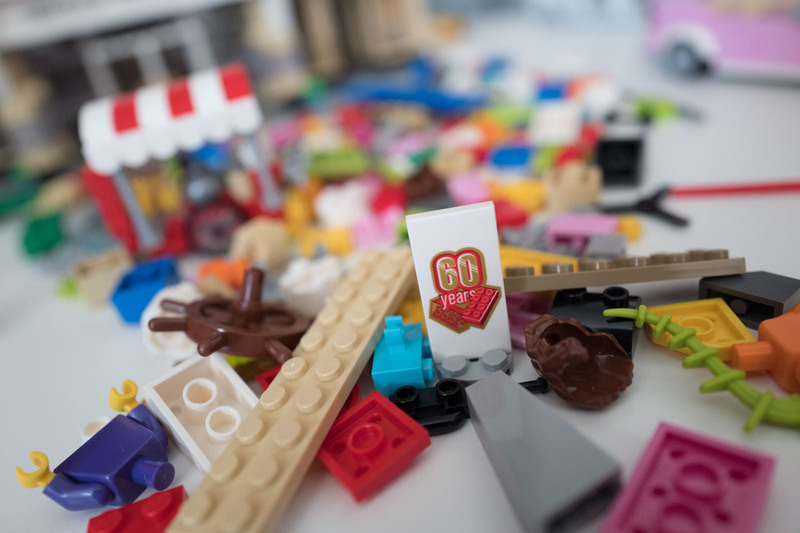 Nearly five million Lego pieces were being shipped from Tokyo Japan to New York City when the ship was hit by a massive wave, toppling the Lego box overboard. The Legos spilled into the sea near Cornwall, UK, and continue to appear on British shores. No one knows how many more Lego pieces will threaten beach-goer’s feet in the years to come. Almost twenty years later, a stranger, larger Lego piece will wash ashore. Surprisingly, this wasn’t the first giant Lego man to float onto a beach. 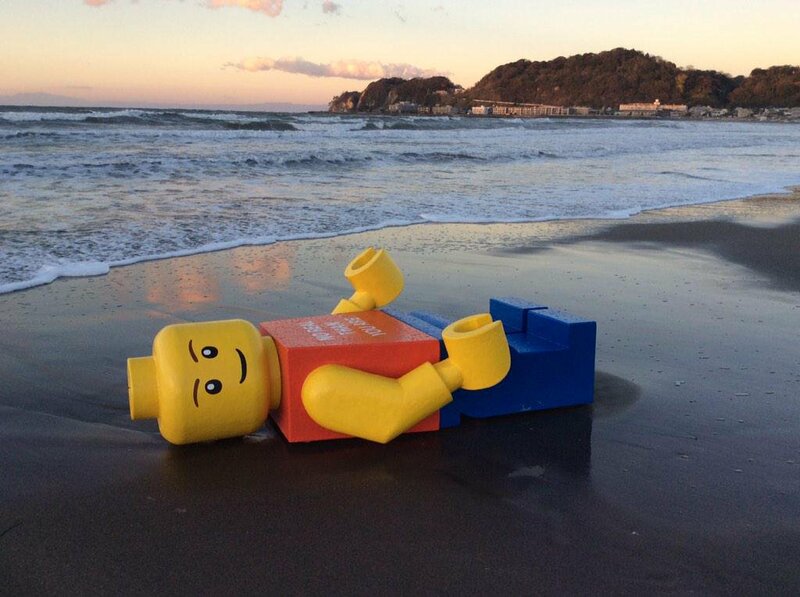 In 2012, a Lego man glided onto a California beach. And a year before that, Florida’s beaches were greeted by another giant Lego man. 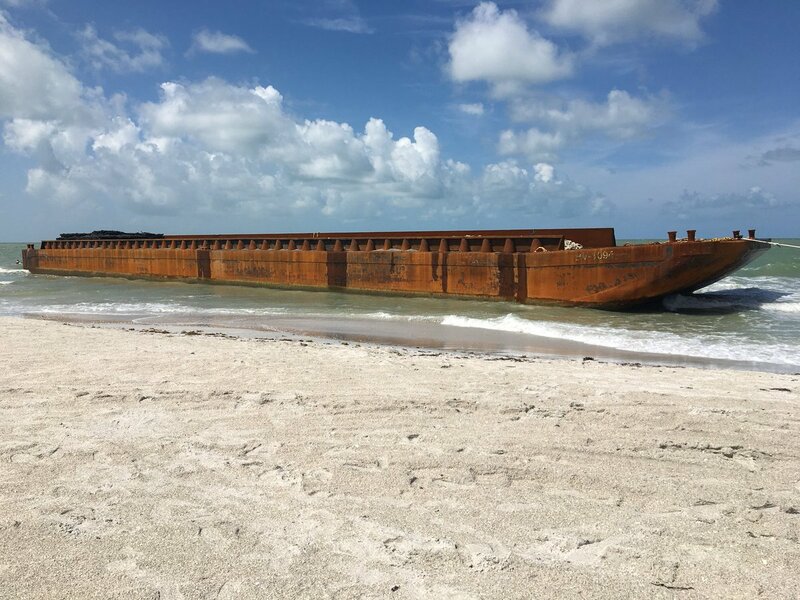 In 2018, a 40-ton barge drifted onto Florida’s St. Pete Beach. Measuring at 200 ft long, 40 ft wide and 8 ft tall, that barge shouldn’t have moved. Only a week before, a recent storm created 7 ft waves that pushed the barge almost 30 miles. Luhr Bros Inc., who owned the barge, claimed that it was used for a beach restoration project in Pinellas County. Coastal resource managers had to wait for the storm to pass to finally move it. Gino Covacci discovered an unusual blue beauty while strolling along Pompano Beach in Florida. It wasn’t a seashell–it was an enormous eyeball. Instead of panicking, Covacci took it home to his fridge. Later, the Florida Fish and Wildlife Conservation Commission grabbed it to study. Originally, Covacci expected the eye to be from a squid. But experts discovered that the eyeball belonged to a 6 ft long swordfish. Based on the clean cuts around the eye, experts determined that the eye was cut out by a fisherman and then tossed back into the sea. Coming up are tear-jerking remnants from a couple’s past. A letter in a bottle may be cry for help, but these letters cried for a safe return. 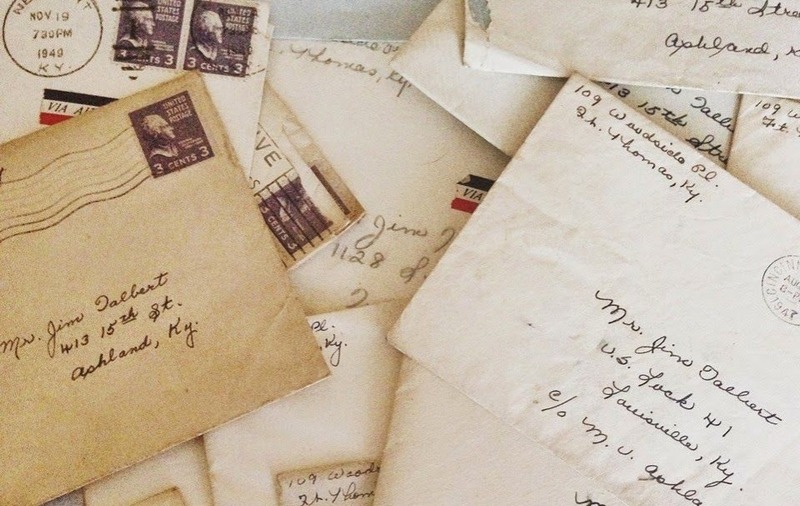 Found on Atlantic Highlands beach trail by a 14-year-old boy, these 57 love letters dated back to World War II. Somehow, they remained legible until they were found in 2012. The letters were written by a young woman in New Jersey to her boyfriend in Vermont. They dated 1942-1948, up to the week they got married. The family who found the letters later tracked down the author. She was still alive, though her husband passed away in 1991. Since 2007, feet started washing up onto shores along the Salish Sea from Washington state to British Columbia, Canada. 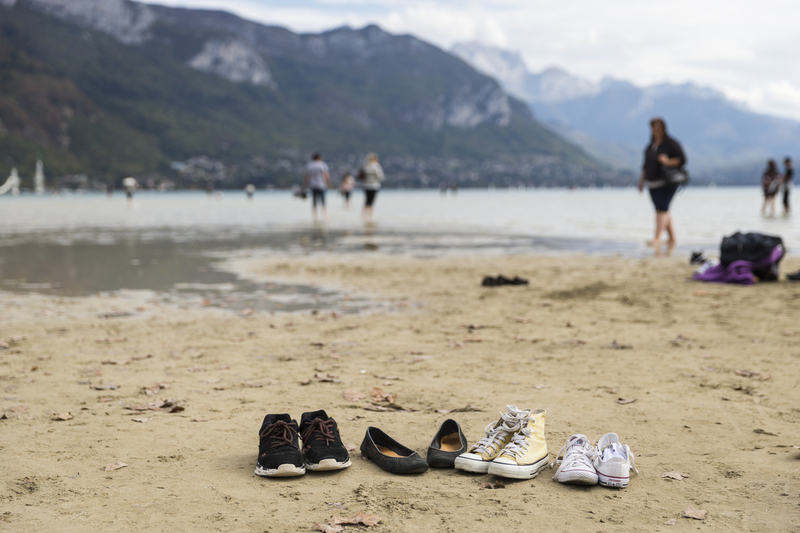 As of April 2019, 21 feet have been spotted by beach-goers. Some wear New Balance, others Nike, but all are disconnected from the rest of the body. No one knows why these feet keep showing but in 2017, Canadian coroner’s office ruled out foul play. They suspect that the feet detached naturally from decomposition, and remained preserved within the shoe. None of the feet’s owners have yet been identified. Some less morbid pop culture references appear in the waves of the coming slides. Since the 1980s, plastic Garfield phones would creep onto the shores of Brittany, France. At first, people thought these phones could have rolled from the deep sea. But after sending divers and submarines to look for the source of the phones, none popped up. Eventually, a local farmer guided the president of the environmental group Ar Viltansou to a beach cave. He claimed that a storm in the ’80s threw a shipment of these Garfield phones into the shoreline cave. The lasagna-loving cat toy housed quite a few starfish and crabs in the meantime. When a beach-goer called the police to report a body floating in the water, police rushed to the scene–only to find a beloved extraterrestrial. A life-sized E.T. model tumbled onto the shore of Old Portsmouth in the UK in April 2019. The doll belonged to Margaret Wells, whose daughter crafted it for her. E.T. had been stolen in September, but Wells luckily got the doll back. He was a bit roughed up and lost a finger, but still intact. Think these toys are worth much? Coming up, items worth a jackpot found on the beach. A Japanese resident of Yokosuka discovered four backpacks of cocaine in 2013. The 20 bricks of coke came out to $48 million. Each brick weighed 2.2 pounds and remained securely wrapped in plastic. According to the Fuji Network News, this find is the biggest drug haul in Japanese history. The bags were apparently tied together and set afloat with buoys. Why? No one knows. But it’s fair to assume that someone messed up big time. Despite its name, ambergris is actually excrement produced in a whale’s intestines to guard its insides against sharp squid beaks. But why is it worth so much? Well, ambergris is used in perfumes to make the scent stay on the skin much longer. Since late 2018, experts have been scratching their heads over this mystery object that landed on the shores of Charleston, South Carolina. The Lowcountry Marine Mammal Network posted the object to Facebook in late 2018. From the picture, the object looks like metal. But it is actually foam, reports say, and even floated on the seawater. 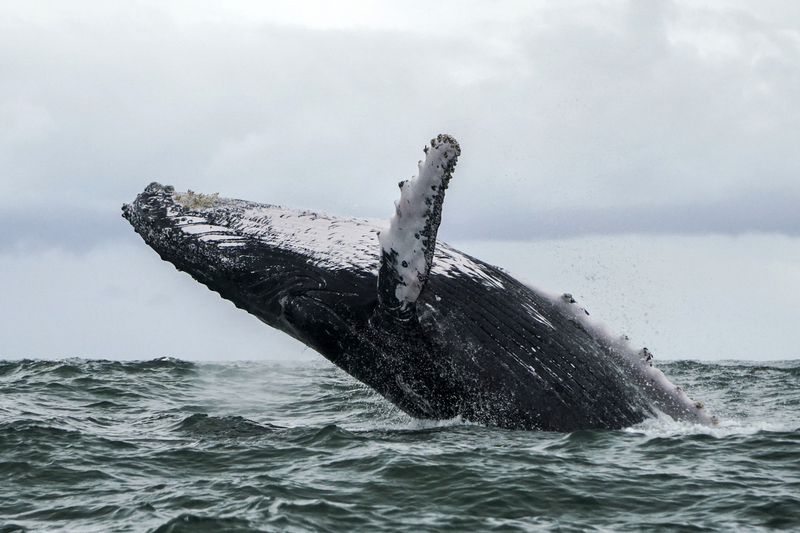 Many believe it looks like a piece of an aircraft or a space ship, but the Marine Mammal Network asserts that it must be a flotation device. Still, no one knows. Coming up, an even tastier surprise floated into North Caroline just a few years earlier. In 2014, New Yorkers flocked to take pictures with a piano floating in the East River under Brooklyn Bridge. 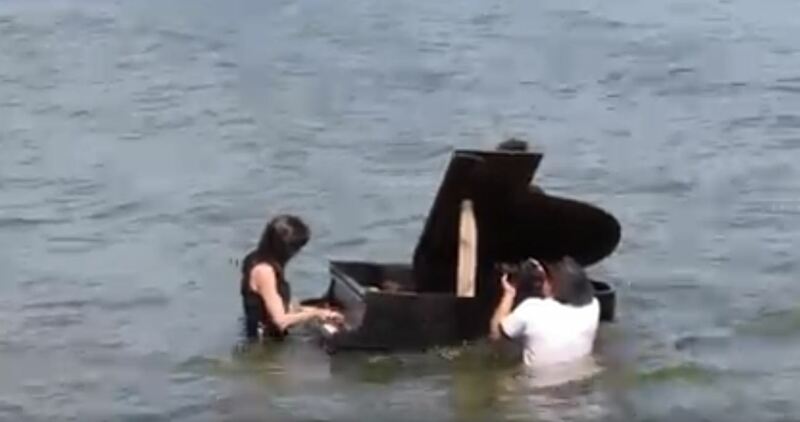 The piano remained half-submerged until it finally washed up onto the shore. Surprisingly, it remained in good condition, but it makes no sound. No one really knows where the piano came from. Some suspect that it may have fallen off a truck, or was abandoned by a former owner. Either way, it has captured the imaginations of many New York photographers. A fisherman in North Carolina had to call a local shop owner to report, “I got two stripers and 35 bags of Doritos.” That’s because, in 2006, a trailer-sized box filled with thousands of Doritos tipped overboard near the beaches of Hatteras Island. Hundreds of these red and blue bags lay scattered all over the beaches. Clean-up volunteers ended up filling trucks with mostly undamaged bags. The bags washed up included Spicy Nacho, Cool Ranch and Nacho Cheese Doritos, in case anyone wants to take a bite. A gym teacher in Turkey stumbled upon an odd site during his beach vacation. 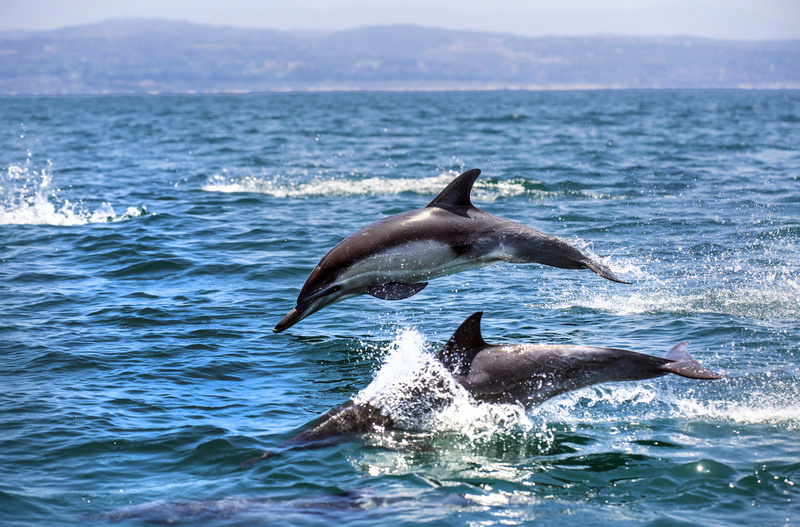 In 2014, Tugrul Metin reported finding a two-headed dolphin, with two sets of eyes, and one blowhole. Though the dolphin was buried the next day, it was later dug back up for further study. Scientists diagnosed the dolphin with polycephaly, where an animal develops two heads. This condition makes survival a struggle for the animal. Studies find that the mutation is likely caused by marine pollution. In 2014, Hannah Listle walked along the beach of Kingston, Washington and ran into a startling sight. 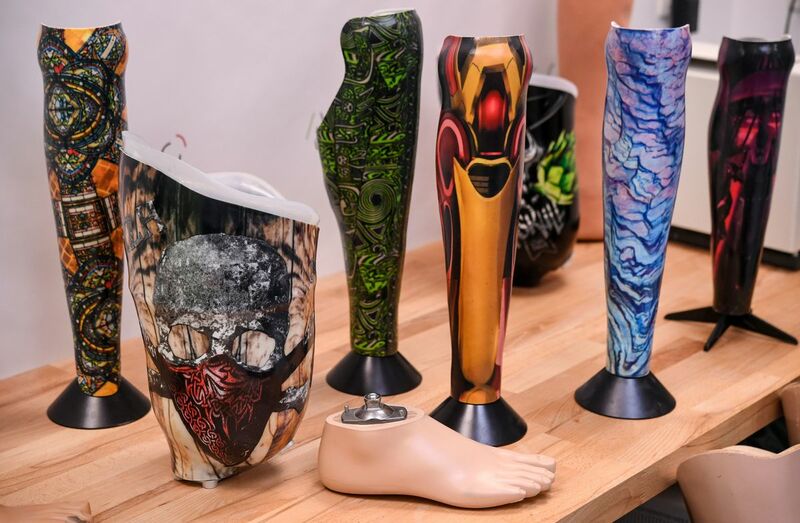 It may not have been a leg, but it looked like one at first–it was a beautifully decorated prosthetic leg. Listle posted her findings on Facebook and found the original owner only four days later. The owner, Megan Smith, was jumping off rocks into the water with her husband. On the third or fourth try, she realized her leg was gone. Luckily it didn’t take long to get it back since Smith could not afford another one. These objects may have been unnatural, but a completely natural phenomena contributes equally weird results. A shoreline in western Siberia was absolutely flooded with snowballs in November of 2016. Each snowball was around the size of a tennis ball and covered 11 miles of coastline. Oddly enough, the water did not freeze over as the balls did. BBC reports stated that the icy orbs formed through natural phenomena. According to them, the snowballs “result from a rare environmental process where small pieces of ice form, are rolled by wind and water, and end up as giant snowballs.” Beach snow day anyone?